2 Disc Set -- Filmed April and May 2003 after Jay won second consective AC title. 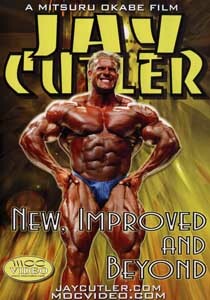 Includes Jay's high intensity and high volume semi-off-season whole body workouts. Exclusive interviews show you Jay's personality and his serious approach to bodybuilding. (Topics:Current Routine & Diet , Supplementation, Gain Mass Theory, Charity Activities, Memorable Places and more.) Guest appearance at San Diego Classic, Jay on & off stage, Educational business seminar at El Toro High school. Jay speaks to the class about : First Contest, To be a Pro, JKC Enterprises, Up Set, Eat Sleep Train, Jay's Day, Peak, Squats, $1,000/Week, Consistency...and more. and CRIBS @ his brand new Las Vegas home. A Mitsuru Okabe Production; Running time: 279 minutes; DVD-Video NTSC; All Regions; DVD Release date: March 2004.